Yolanda Foster went rogue with her Real Housewives of Beverly Hills blog last week (and possibly got in trouble, as it was later wiped out, severely edited, and posted on Bravo), but she turned her blog over to Bravo this week. As per usual, it is 90% journey and 10% episode. Yolanda‘s blog, which reads like her self-nomination for sainthood, begins, “As I watch the season unfold and observe myself going back six months in time, I feel so much gratitude for the improvement I have made and still hopeful for a full recovery.” Which she has tentatively scheduled on the day after her divorce from David “My Alimony“ Foster is settled. Yolanda demands we take chronic Lyme disease seriously and cries out for all the “financially devastated” patients she has encountered during her search for the cure. Yet she never seems to share what has or has not worked for herself, you know, to spare those who can’t afford to waste money on quack treatments. 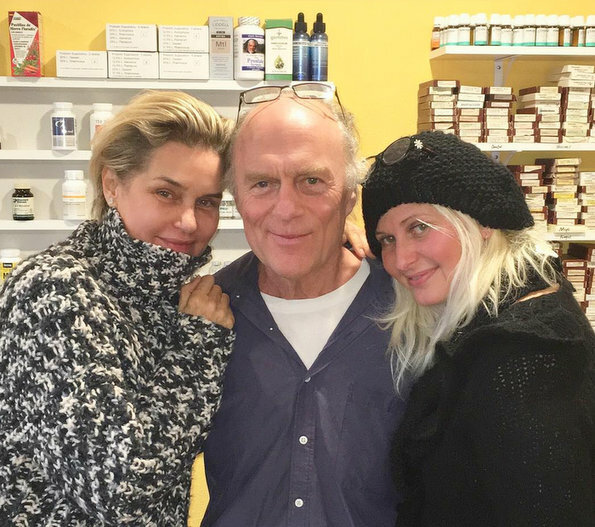 Yolanda recalls her recent visit with Dr. Klinghardt (in the photo above), who says 50% of healing is done in the emotional and spiritual body. Addressing the actual episode (the whole point of these blogs), Yolanda says she was experiencing “very limited brain function” at the restaurant. And that, combined with not knowing who she can believe and trust anymore, is why she started to cry while talking to Lisa Vanderpump. TELL US – WHY DO YOU THINK YOLANDA STARTED TO CRY WITH LISA? Kathryn Edwards Claims She Did Nothing Wrong In Relaying Erika Girardi’s Comments To Lisa Vanderpump!